Energy-related carbon dioxide emissions climbed for the second straight year in 2018 as global energy demand surged, a new International Energy Agency report shows. Why it matters: To avert more severe consequences of human-caused global warming, countries need to begin making steep cuts to emissions now. The new global data clearly show that's not happening, as the world hasn't even begun to bend the emissions curve downward, as agreed to in the Paris Climate Agreement. Threat level: A major United Nations scientific report last October analyzed what's needed to hold the global temperature rise to 1.5°C, or 2.7°F, above pre-industrial levels, the aspirational goal of the Paris deal. Where it stands: Overall energy consumption rose by 2.3% last year, which is almost twice the average growth rate since 2010, the IEA said, with fossil fuels meeting most of the increase despite strong renewables growth. They attributed the increase to the "robust global economy" and higher heating and cooling needs in some regions. Energy-related CO2 — which accounts for the vast majority of all CO2 emissions — climbed by 1.7% last year following a slightly smaller increase in 2017. China, India and the U.S. jointly accounted for 85% of the net emissions growth. Global energy intensity — a measurement of energy per unit of GDP — fell again last year. But the 1.3% improvement was smaller than recent years, showing a slowdown in efficiency gains. The big picture: This is at least the second major analysis to show renewed emissions growth over the last 2 years, following a plateau in 2014–2016. A research collaboration called the Global Carbon Project has separately concluded that that emissions rose in 2017 and 2018. Our thought bubble: Axios science editor Andrew Freedman notes that climate scientists have shown that global warming is already harming people around the world, including in the U.S., largely through extreme weather events, such as heat waves. "Scientists have shown that the earlier emissions fall, the less likelihood there is of losing huge chunks of the Greenland and Antarctic Ice Sheets and other severe climate change impacts." Let's spend a little more time with the new IEA data on coal. The big picture: Overall coal demand moved up slightly in 2018, by 0.7%, as higher use in India and China offset declines in Europe and the U.S. This afternoon the Senate is slated to take a procedural and symbolic vote on the Green New Deal resolution. Where it stands: Majority Leader Mitch McConnell opposes the GND along with other Republicans. But he's bringing it up so Democrats are on the record over the measure, which has uncertain support in Democratic ranks. What to watch: Most Democrats plan to vote "present" in an effort to show a united front. Go deeper: E&E News sets the table for the vote here. 2020: Axios' Rashaan Ayesh takes you on a whirlwind tour of where over a dozen White House candidates stand on the GND and climate more broadly. The big picture: The resolution is a wide-angle statement of ambition, but experts are offering ideas to fill in the blanks should a political window open in the future. He's on board with the urgency of the GND and writes that the time for incremental, "moderate" policies has long since passed. But Bordoff doesn't think that many GND backers' emphasis on massive public sector spending is optimal or feasible, though he also supports more robust federal investment in R&D, transit and more. Instead he sees a number of policy options that can leverage and steer private investment decisions, noting "robust government policy must ... ensure those economic incentives are aligned with our broader public policy goals." Capitol Hill: Rashaan also reports that GOP Sen. Lamar Alexander, who isn't seeking re-election, said yesterday that the GND is "so far out in left field that no one is going to take it seriously." But he's offering his own ideas. Why it matters: Alexander proposed a plan of his own called "The New Manhattan Project for Clean Energy," which argues that the United States' "extraordinary capacity for basic research" should be used to combat "10 Grand Challenges" in the next 5 years. Crude oil: This Bloomberg feature looks at how U.S. crude oil exports, which have already surged, could go a lot higher as shale production grows. They've been in the 3 million barrel-per-day range in recent weeks. "Oil traders and shale executives believe U.S. crude exports are set reach 5 million barrels a day by late 2020, up another 70 percent from current levels. If the U.S. hits that target, America will be exporting, on a gross basis, more crude than every country in OPEC except Saudi Arabia," Javier Blas writes. Why it matters: One reason, as the story notes, is that exports have given the U.S. more leverage to impose harsh sanctions against Iran and Venezuela "knowing the flow of crude from Texas will keep on rising." Natural gas: Via the Houston Chronicle, "Dallas pipeline operator Energy Transfer and Dutch oil giant Shell have signed an agreement that two companies say moves their proposed Lake Charles LNG export terminal towards a final investment decision." The parties said they have started "actively engaging" with companies on engineering, procurement and contracting for the project. The big picture: The Wall Street Journal notes that the project represents "a bet that the future of U.S. shale gas lies in selling it for higher prices in overseas markets." 22: That's the percent of U.S. gasoline costs that stem from taxes, according to this note from the Energy Department's Vehicle Technologies Office, which is based on IEA data. Why it matters: It's a much lower share than a number of very large economies that have much higher fuel prices. 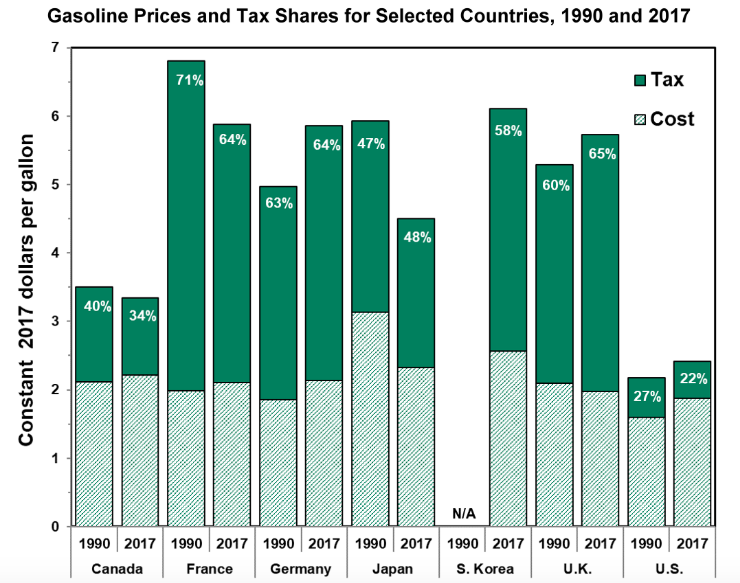 "Over 60% of the cost of gasoline in France, Germany, and the U.K. was for taxes," they point out. "After years of hesitation, New York is poised to become the first city in the United States to introduce congestion pricing, which would put new electronic tolls in place for drivers entering the busiest stretches of Manhattan."